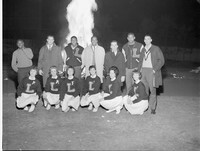 Some players from the 1963 NCAA Basketball championship team pose with cheerleaders before the pow-wow bonfire at the beginning of the season, Fall 1962. Loyola player Vic Rouse soars high for a basket against Mississippi State in the NCAA Regional Semi-finals. 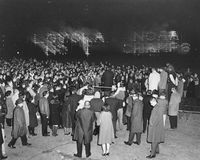 Image from the1963 Loyolan.